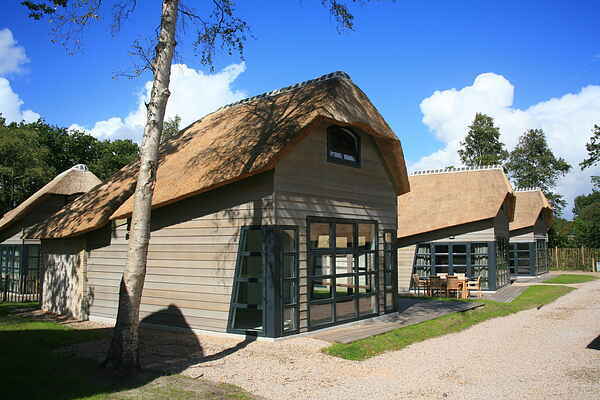 The luxurious detached lodges are characterized by wood and reed, fitting into the lovely surroundings of Schoorl. There are two different possible variants: a four person. (NL-1871-15)and a 4-pers. adapted variant (NL-1871-16 with adjustable and wheelchair accessible kitchen with low combi-microwave, shower with seat, adjustable toilet and sink, a bedroom with high/low beds and a lift system mounted on the ceiling. This type is at the front of the park on the paved road). The door of the modified version (NL-1871-16) is 90 cm wide. The other passageways in the accommodations are 80 cm. The accommodation is therefore not suitable for guests in an electric wheelchair and only suitable for guests who are not completely dependent on a wheelchair.